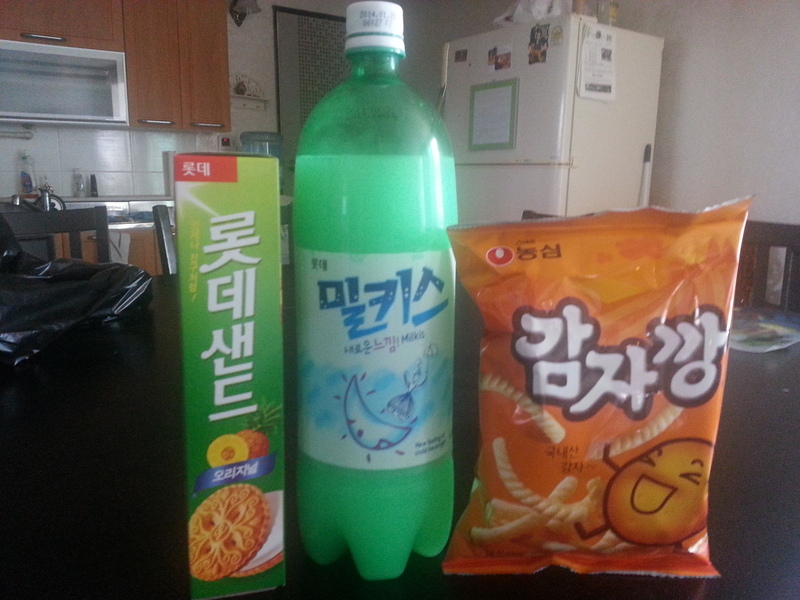 Today, after I dropped The Boy off for his Hapkido lessons, I stopped by the local 마트 [“ma-tuh”] (mart) for some trash bags and an afternoon snack. I have really taken a liking to browsing these mini convenience stores for some tasty treats and hit the nail on the head with today’s finds. I decided that while I enjoy my snacks, and my hour and a half of kid-free time, I’ll share this moment of zen with you all. On the left, we have some cream-filled cookies. Pretty much your basic shortbread cookie, but the filling is PINEAPPLE flavored! YUM! I wish I could give an exact name for them, but all I got out of a Google Translate was 롯데샌드 오리지널 [“los-de-saen-deu o-li-ji-neol”] would be the brand Lotte Sand (sandwich cookie? ), Original (flavor). They are pretty tastey and come with two small packs of 6 cookies inside. I find the packaging to be helpful, so that I don’t accidentally (HAHAHA!!!) eat all 12 cookies at once. Because you know I would. In the middle is the famous (in Korea?) Milkis drink. You can pretty much find this all over the place, including the 1970s looking vending machines which holds super small (for American standards) cans of beverages. Milkis is a carbonated beverage that is made with a touch of milk. There’s a variety of flavors, and I really need to find the fruit flavored ones, but I am officially renaming this Korean Baptist Punch, because it tastes just like Baptist Punch!!! (!!!!) If you don’t know what Baptist Punch is, that’s because it’s another name I made up for “punch” aka frozen sorbet mixed with Sprite, which melts into this creamy delicious carbonated concoction. I don’t think it really has an official recipe name, so I call it Baptist Punch, because it is usually the default beverage at all events hosted by Baptists (baby showers, bridal showers, weddings and anniversary celebrations). On a side note: it is one of my favorite drinks, we even served it at our wedding and I make my own single servings of it in a glass every year for our anniversary. NOM! Now I don’t have to do that for the next two years, because I can buy it in a bottle! The next item, on the right, are pretty much puffed potato sticks. That’s all I got. Sounds pretty boring when you compare them against the other two items, but they are lightly seasoned, and pretty tasty. Finally, I thought I’d also show you what I got for The Boy for a post-hapkido snack, so you don’t think that I’m keeping all of these treats to myself. So here is a picture of 바나나우유 [“pa-na-na u-yu”] (banana milk). 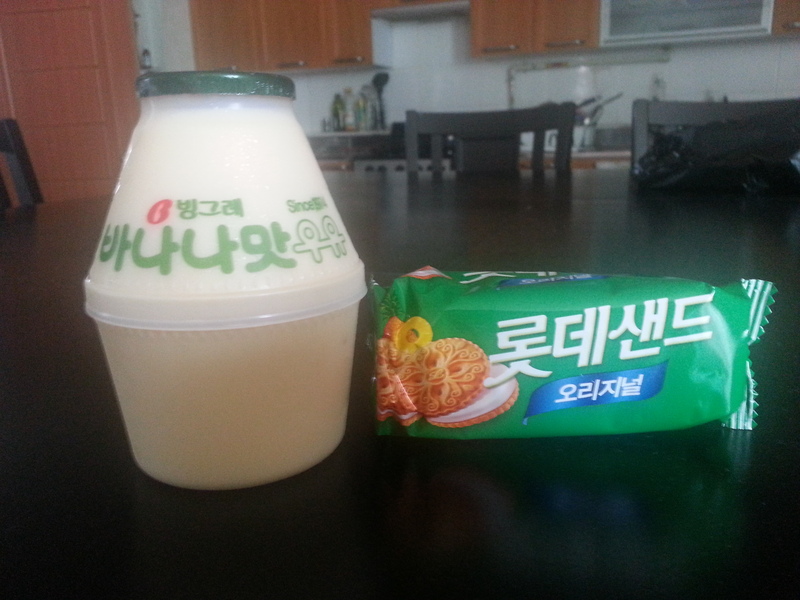 The u-yu (milk) here is delicious, so far I have found pa-na-na (banana) and dal-gi (strawberry) flavors. I am not sure if they have any other flavors, but there are also these really cute miniature bottles that are like yogurt smoothies. When I say little, I really mean little. I’ll try to get some of those for the next Scooby Snacks post. So the u-yu comes in containers that you don’t actually open. It has a foil seal on the top, and you get a small straw (aka glorified coffee stir-stick with a pointy end…er…not far off from a Capri-Sun straw) and jab it through the foil. Pictured with it is the other/second pack of “original flavored cookies” that I was good and did not devour. 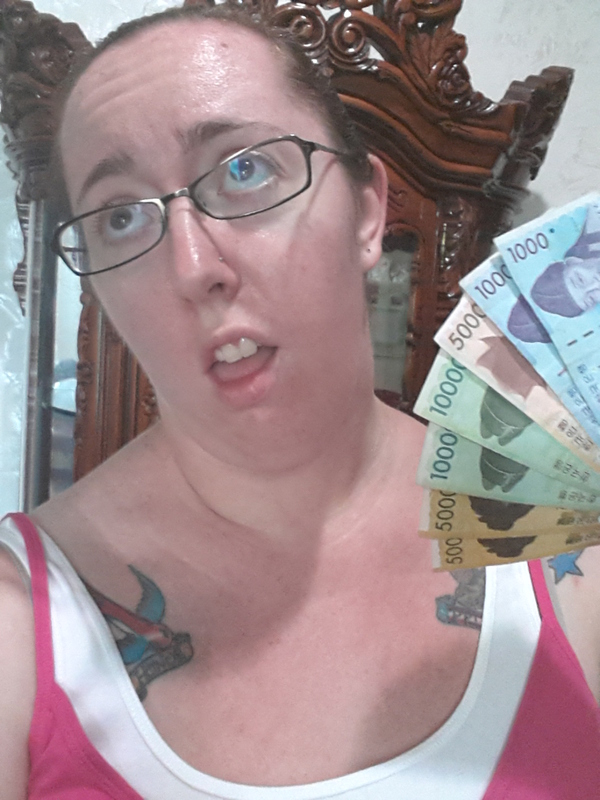 Here’s a ridiculous picture I took of me fanning myself off with some Korean money. I just got home from exchanging some cash (the exchange rate is higher today than usual!). While sweating it out on the walk home, I was feeling quite proud of myself with my new found language skills. I can successfully ask for a 50,000₩ note (o-man won) to be changed into five 10,000₩ notes (man won)! Actually, I can also ask for a 1,000₩ note (il-ch’on won) to be changed into ten 100₩ coins (paek won), too. I took my mad Korean Language Class skills that I learned from the class at ACS (Army Community Service, for those non-Army folk) and put them to good use a few weeks ago. Around here, you never want to go to the market with a 50,000₩ bill, because you’re not likely to find someone who can make change for it when you’re just paying a few thousand won for an item. They also seem to find it a big inconvenience. So I try to keep the big money for the bills only. So…it’s getting hot here, and quite humid, as you’ll also note from the layer of sweat shine on my forehead and nose. Monsoon season is upon us, so we’re pretty much going around with a constant feeling of yuck on our skins. Remember all those times I said I was tired of living in the desert? Well I take it back, for the next couple of years. Until we retire in the glorious mountains of either Colorado or Washington states, I doubt I’ll ever stop complaining about the type of weather we’re living in. That’s all of the big news around here for now. I’ve had other things I want to blog about, but at the time the idea comes up, I either am busy doing something else, or busy doing something else. I get about 1.5 hours of free time each day during the week, thanks to the joys of homeschooling. That is dripping with sarcasm like my husband’s PT shirt drips with sweat (gross!). Really, I suppose the homeschooling is going well…I haven’t given up yet…but there’s a long way to go for us figuring out our routine. Unfortunately, I’m a person who wants instant results, and the rollercoaster good days vs. bad days does not encourage me one single bit. But I am still completely sold on the decision to be doing it, and am looking forward to the options I have for tweaking our routine up for the summer time.